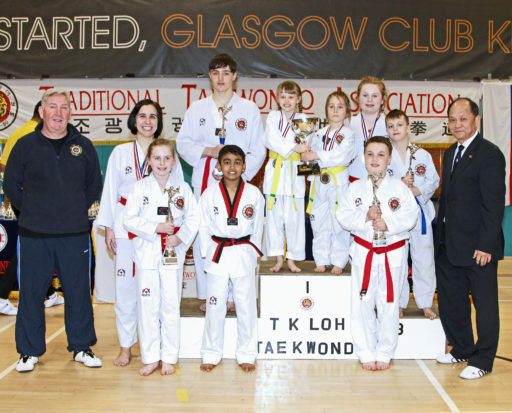 Falkirk and Callander Taekwondo club had a great start to 2019 at the recent british Taekwondo championships held by the Traditional Taekwondo Association led byGrandmaster TK Loh. We had some new young competitors competing for the first time and they allenjoyed the experience. We won Silver medal in the team poomsae event where Areti Lymperopoulou won medalswith her daughter Artemis McIntyre and Ruby Morrison. Areti also won Silver in the adultfemale team sparring event along with team mates Dilyana Radulova and Holly Rivett. For sparring brothers Rhys and Jacob Clark won Gold medals in their respective weight category,Ross Duff also won Gold in the children’s sparring event.In the female individual sparring Toni Kent won Gold and Emily Aitkenhead won Silver. Overall we received 4 Golds and 7 Silvers, winning best team spirit for our efforts. Our club trains 4 days a week in Falkirk and Callander, all new students are welcome tocome along and give Taekwondo a try. Contact Duncan on 07713 193841 or email duncirvine@gmail.com. Here is a photo of our competitors with Duncan Irvine chief instructor of Callander and Falkirk clubs along with Grandmaster T.K.Loh the head of the Traditional Taekwondo Association. From L to R: Duncan Irvine, Areti Lymperopoulou, Toni Kent, Rhys Clark, Samarjit Santhosh, Ruby Morrison and Artemis Mcintyre holding our trophy, Emily Aitkenhead, Ross Duff, Jacob Clark and Grandmaster TK Loh.